Terahertz radiation has many applications—but high intensity terahertz radiation sources are hard to build. A team of researchers at TU Vienna has now managed to create a new kind of quantum cascade laser with an output of one watt of terahertz radiation, breaking the previous world record of about 0.25 watts. Terahertz waves are invisible, but incredibly useful; they can penetrate many materials which are opaque to visible light and they are perfect for detecting a variety of molecules. 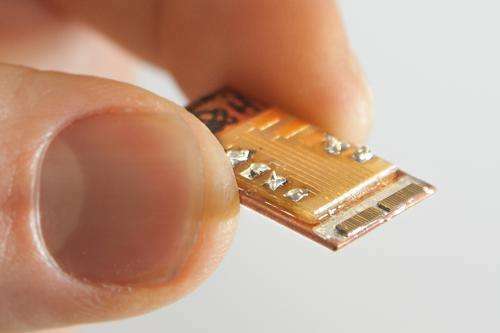 Terahertz radiation can be produced using tiny quantum cascade lasers, only a few millimetres wide. This special kind of lasers consists of tailor made semiconductor layers on a nanometer scale. At the Vienna University of Technology (TU Vienna) a new world record has now been set; using a special merging technique, two symmetrical laser structures have been joined together, resulting in a quadruple intensity of laser light. For the electrons in each layer of the quantum cascade laser, only certain discrete energy levels are allowed. If the right electrical current is applied, the electrons jump from layer to layer, in each step emitting energy in the form of light. This way, the exotic terahertz radiation with wavelengths in the sub-millimetre regime (between microwaves and infrared) can be produced with high efficiency. Many molecules absorb light of this spectral region in a very characteristic way – they can be considered to have an "optical fingerprint". Because of this, terahertz radiation can be used for chemical detectors. It also plays an important role for medical imaging; one the one hand, it is non-ionizing radiation, its energy is considerably lower than that of roentgen radiation, therefore it is not dangerous. On the other hand, its wavelength is shorter than that of microwave radiation, which means that it can be used to create higher resolution images. These applications may bring back memories of the legendary "Tricorder" from Star Trek, a portable multi-purpose analytical instrument. For measuring objects at a distance and for medical imaging, compact light sources with a very high optical power are required. 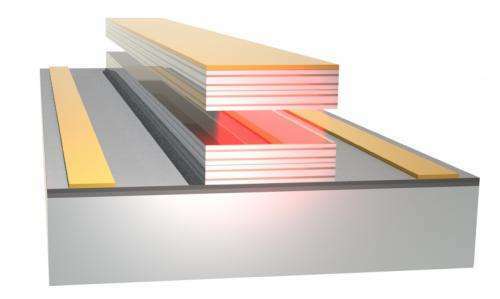 A possible way to increase the laser power is to use more semiconductor layers. A higher number of layers means that the electron changes its energy states when it passes through the structure, and therefore the number of emitted photons increases. The production of such multi-layer structures, however, is extremely difficult. Prof. Karl Unterrainer's team at the Institute of Photonics at the Vienna University of Technology has now succeded in merging two separate quantum cascade lasers in a so-called bonding process. "This only works for a very specific design of the quantum cascade structure", says Christoph Deutsch (TU Vienna), "With standard quantum cascade lasers, this would definitely be impossible." Symmetrical lasers are required, through which electrons can pass in both directions. The team had to study and compensate for the asymmetries which usually arise in the laser. The higher the number of layers, the more photons are produced. In addition to that, the efficiency is increased due to improved optical properties. "This is why doubling the number of layers eventually leads to quadruple power", explains Martin Brandstetter (TU Vienna). The previous world record for terahertz quantum cascade lasers of almost 250 milliwatts was held by the Massachussetts Institute of Technology (MIT). The laser of TU Vienna now produces one watt of radiation. This is not only another record for TU Vienna, breaking the one-watt barrier is considered to be an important step for the application of terahertz lasers in a variety of technological fields.